Gerlach is an everyman's tale about coming of age. 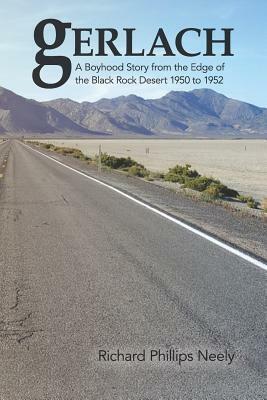 It is the author's recollections from Gerlach, Nevada, "a rumpled, unmade bed of a town," and the neighboring U.S. Gypsum mining town of Empire, in the early 1950s. While our country was captivated by the headlines of the Korean War, the McCarthy hearings, and the attempt to assassinate Harry Truman, Gerlach and Empire existed in an isolated world unto themselves. No phones, no newspapers, uncertain radio reception, and only one barely passable gravel-rutted road, 66 treacherous miles to the nearest highway. Located 120 miles north of Reno, this colorful and unbridled town of the Wild West had five bars, a whorehouse, and a posted population of 150 people--many of them sober. Gerlach is a cinematic journey seen through the eyes of a 13-year old boy, about childhood buddies, fathers and sons, first loves, and first experiences. It is a collection of fittingly wild stories of an out-of-control schoolhouse, a summer spent working on a ranch, and life on the trail of a cattle drive. It tells of small moments, a terrible secret, two great tragedies, and much more. Amidst the mischief, failure, and even redemption, Gerlach is ultimately a story of the hero who resides in ordinary people. Only God's imagination could have created this place and these people.